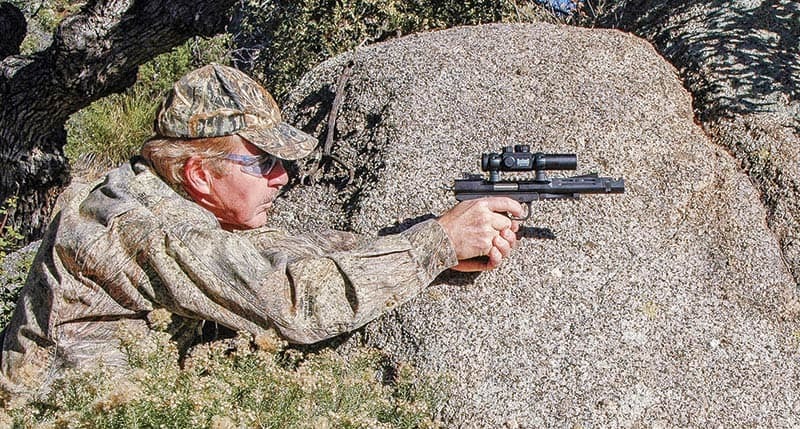 The new .22 WMR Scorpion is a powerful small game and varmint rig for the field. Where’s Holt? When you can uncrate a new handgun, drive to the range and place the first five Federal Premium 30-gr. Sierra loads into 0.41" at 25 yards, you just might be holding a .22 Magnum Volquartsen Scorpion. In the realm of super-accurate rimfire pistols, Volquartsen’s Scorpions occupy a place all their own. At last count, the company cataloged 21 Scorpion models in .22 Long Rifle with an endless variety of barrels, stocks, sights and grips. Whether it’s bullseye popping or small game hunting, there’s a model there for every pursuit. Federal’s 30-gr. 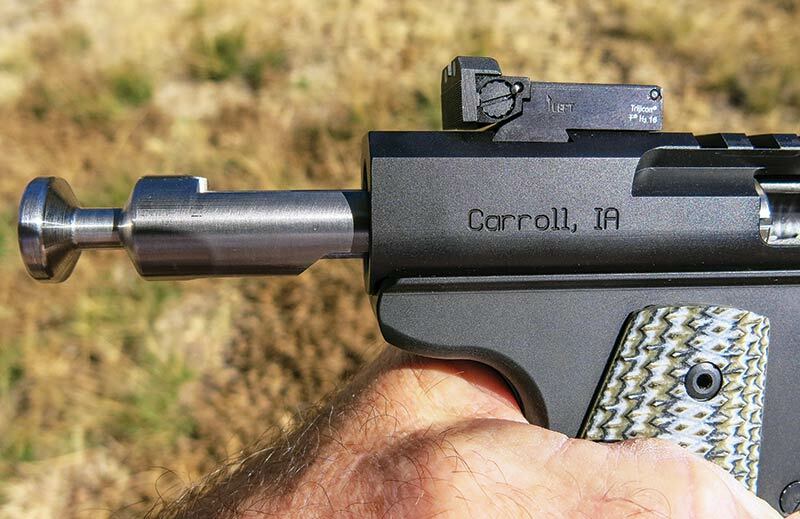 Sierra and CCI’s Maxi Mag TNT loadings proved sensationally accurate, but the rest of Holt’s .22 WMR ammo menu wasn’t far behind. Introduced by Winchester in 1959, the .22 WMR was designed to do one thing well — kill varmints and small game. It’s not a plinking round, it’s not a target round and it’s not cheap. Loaded with 0.224" JHPs, polymer-tipped missiles and even solids, the .22 WMR is more accurate, faster and more versatile than it’s ever been in the 60 years of its existence. In power and performance, the .22 WMR is closer to the .22 Hornet than it is to the .22 LR. Offered today with bullet weights ranging from 25 to 45 grains, it’s not only a terrific varmint round, I’ve seen it perform effectively on game the size of small African antelope. In its early days though, the .22 WMR was problematic for handgunners. Winchester initially thought of the cartridge as a rifle round and optimized the powder for long barrels. When gunmakers began chambering it in revolvers, accuracy and velocities were mediocre at best. Fortunately, those days are gone and we can now enjoy excellent accuracy and high velocities in handguns with the smorgasbord of .22 WMR ammo currently available. Locked in a Caldwell Precision Turret Shooting Rest, Bushnell’s 1x28 mm red/green dot optic got the most out of the Scorpion .22 magnum’s potential. Tom Volquartsen founded the business in 1974 and today it’s managed by his sons Scott and Nic. This family-owned company uses a single craftsman to build each gun, start to finish; the builder hand selects the raw materials and test fires each gun before it’s ready to ship. Production methods range from hand-tooling to custom in-house CNC and EDM precision-built technology. A blowback system doesn’t get any simpler and after running five brands and loads through the gun, I experienced no functional issues whatsoever. Their tungsten alloy bolt system works. Volquartsen’s integral bolt racker is worth its weight in gold for the shooter. The new .22 WMR Scorpion is currently available in two models, both in blackened stainless steel with threaded 6" barrels, 9-shot magazines and crisp 2.25-lb. triggers. The differences are minor. 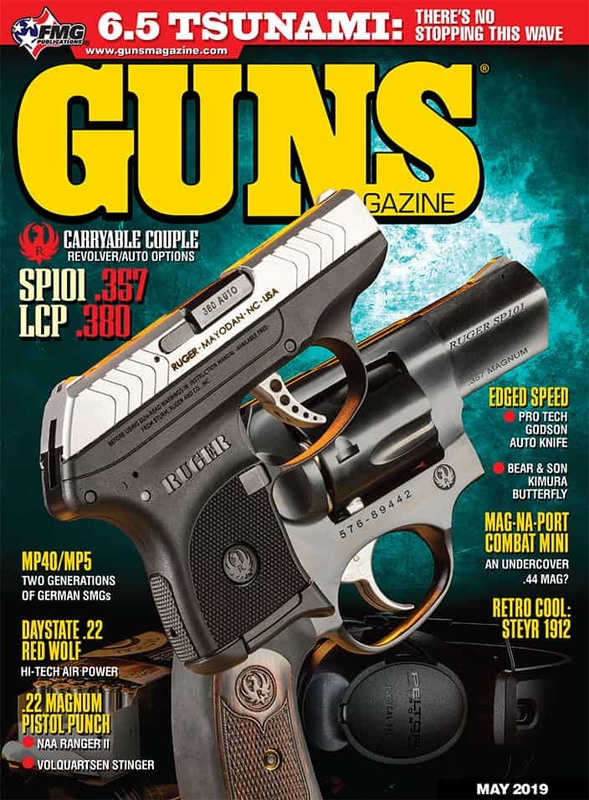 The test gun had the additional upgraded features of a Hi-Viz front and Tritium rear sight, a compensator rather than a simple thread-protecting barrel nut, and their 1911-styled, VZ magnum grips in “Predator Green” rather than straight black. Both models feature integral top-and-bottom Picatinny rails for mounting optics and a bipod. They’re big, stylish handguns. As equipped, the test gun weighed 4.5 lbs. (5 lbs. 6 oz. with the addition of a Bushnell Trophy 1x28mm red/green dot optic in quick detachable rings). How does the new magnum Scorpion perform? The overall balance — with its 6" compensated barrel — is sensational. When on target the Scorpion just hangs there in your hand, giving you the opportunity to focus solely on your sight picture and trigger break. For testing purposes, I shot the Scorpion off the bench supported in Caldwell Shooting Supplies Precision Turret Shooting Rest. 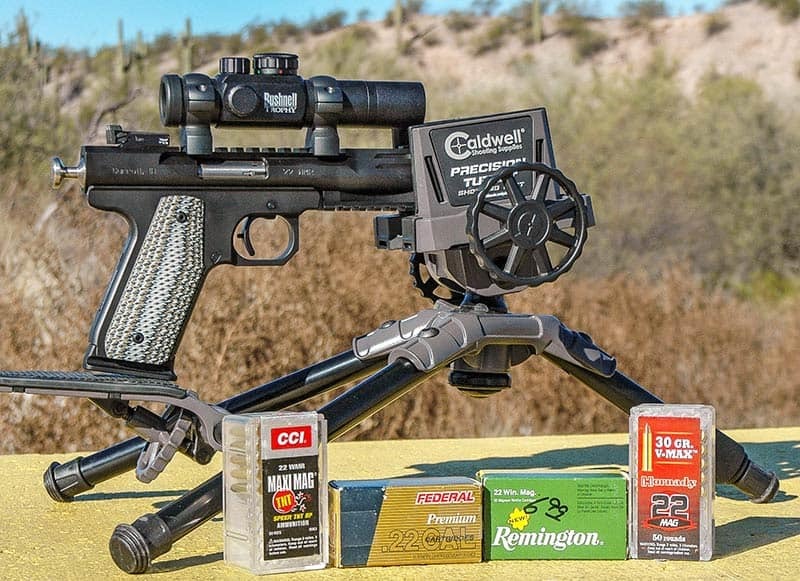 While it was designed for the AR, Caldwell’s rest is the finest, all-purpose shooting rest I have ever used for handguns and rifles. I find it much superior to using traditional bunny bags and pedestal rests. With the Bushnell optic aboard, the Scorpion really delivered at 25 yards. The best, overall, five-shot group was turned in by Federal’s 30-gr. Sierra load measuring 0.41" and averaging 1,732 fps. Yet, to eliminate those darn fifth shot flyers, I measured the best 4-out-of-5 shot groups in the remaining brands. Here are the results: CCI 30-gr. Maxi Mag TNT (0.37/1,843 fps), Remington 40-gr. JHP (0.51/1,445 fps), Armscor 40-gr. JHP (0.72/1,476 fps) and Hornady 30-gr. V-Max (0.88/1,834 fps). What impressed me was not only the general level of accuracy delivered by the Scorpion. With all the different loads, the groups were all clustered in the same area — almost unheard of in the finicky rimfire world. While a variety of Volquartsen Scorpion models in .22 Long Rifle are priced in the $1,250 range, the .22 WMRs command a bit more with the test gun model retailing for $2,115 and its plainer partner, $1,800. Volquartsen products are not inexpensive, but true quality never is. This is a driven company — driven to make the best possible product.